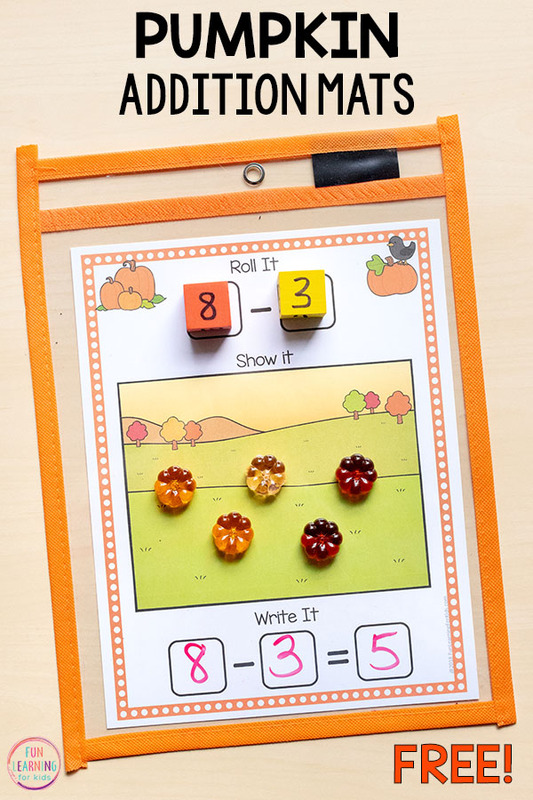 These pumpkin addition and subtraction mats make learning to add and subtract fun and hands-on. 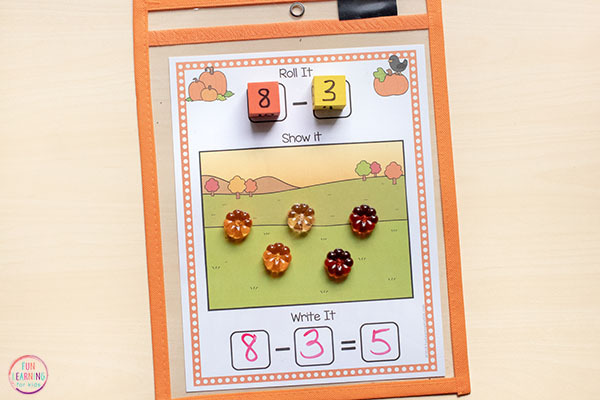 They would be a great addition to your fall math centers! 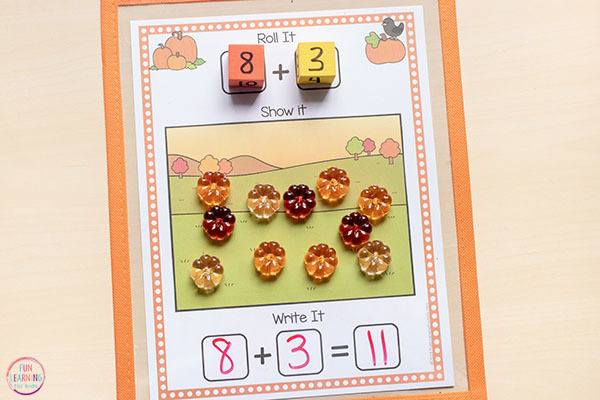 If you are looking for a fun pumpkin activity for your math centers, I’ve got you covered. This one is fun, hands-on and engaging. 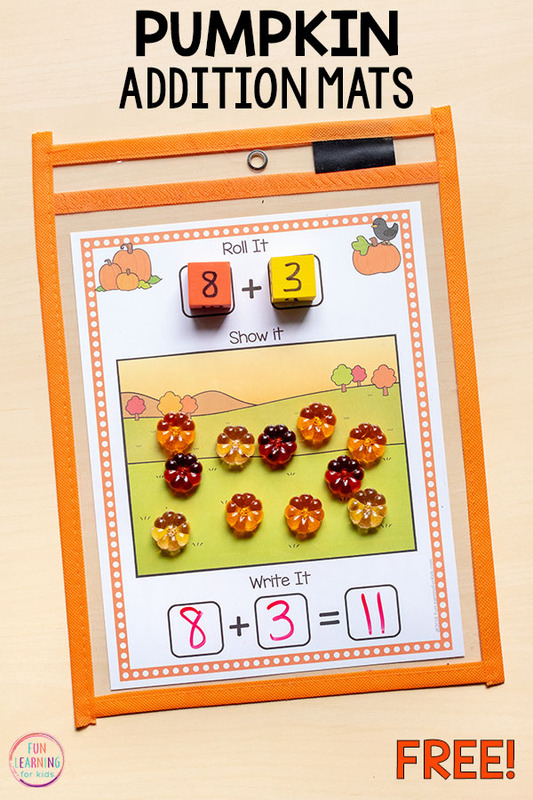 We are still enjoying addition and subtraction mats and this pumpkin version was a hit with the kids. 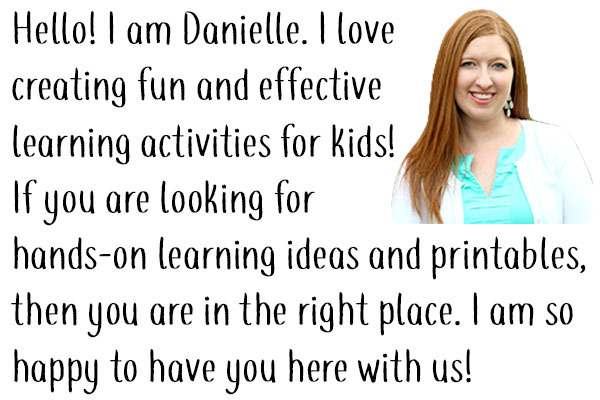 The mats are super simple to use, require no prep beyond printing and slipping into write and wipe pockets, and are engaging for kids. 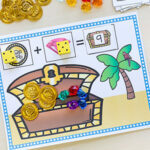 Children love the game aspect of rolling dice and also enjoy using dry-erase markers to write on the mats. 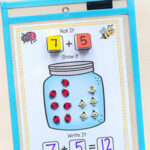 They are hands-on and give children a chance to explore addition and subtraction with fun manipulatives. In this case, we use acrylic pumpkins that you can often find in craft stores or dollar stores. You could also use mini erasers or orange craft pom poms. Changing up the mats and using different types of manipulatives ensures that children don’t get bored with these fun addition mats. 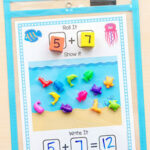 You can use regular dice for numbers 1-6 or make your own and add and subtract numbers 5-10. This is a great way to differentiate the activity for learners at varying levels of ability. You can make dice by using permanent marker on foam blocks. I wrote one number from 5-10 on each side of the block. You can use any numbers you want. Or just use regular dice that go from 1-6. I also like to use 10-sided dice to work on adding numbers to the sum of 20. I just change the 0 to a 10 on the dice. 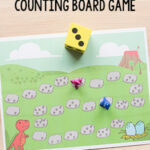 For subtraction, you will also need to make sure that the first dice rolled has numbers that are higher than the second dice rolled. I made a dice in one color that had numbers 5, 6, 7, 8, 9 and 10 and then I made a dice in another color that had 1, 2, 2, 3, 3, 4. So I repeated 2 and 3 to fill each side of the cube. So as you can see, there are lots of ways you can change up these mats to meet the needs of all your students. Then they will put that many pumpkins in the pumpkin patch on the middle of the mat. Next, they will roll the second dice and add that many pumpkins to the patch. Then they will count up all of the pumpkins to see how many there are in total. 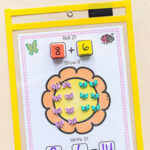 I hope your kids enjoy this fun way to practice addition and subtraction this fall! 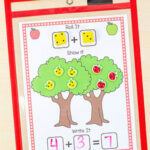 Click the button below to get the pumpkin addition and subtraction mats.